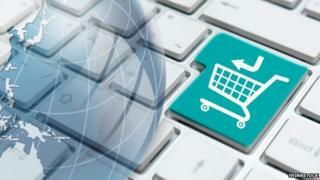 Google has confirmed that it is to introduce a "buy button" to its search results imminently. The button would give Google Search users the option to purchase without needing to visit a separate website. The company's chief business officer, Omid Kordestani, said he wanted to reduce "friction" for users so they buy more things online. Google faces significant competition from Amazon, where many people now begin their search to buy products. "There's going to be a buy button. It's going to be imminent," said Mr Kordestani on stage at the Code Conference in California on Wednesday. The change would make it easier for shoppers to buy products featured in its shopping ads that appear alongside search results. Mr Kordestani also noted that about nine out of 10 purchases are still made offline. He added that the number of location-based searches to help users find something close to them had doubled in the past year. Getting users to buy products as a result of searching is a key revenue earner for Google which currently charges retailers a premium to appear in a prominent position on the results page following a relevant search query. "With Google Buy set to only be available on mobile devices and the search giant recently changing its algorithm to favour mobile optimised sites, it's clear Google believes that smartphones and tablets are the way forward for e-commerce," said Kevin Dallas from Worldpay eCommerce. "This move from the world's biggest search engine might alarm some merchants but companies should see Google Buy as a positive, spurring retailers to acknowledge the benefits for consumers when they invest in making their site mobile optimised. "Customers expect to be able to transact swiftly and safely from mobile devices and any company that hasn't done so will be swiftly outmanoeuvred by more nimble competitors." But Google's move may also cause concern for retailers who are keen to maintain a close relationship with customers said one expert. Steve Mader of retail specialists, Kantar Retail told the BBC: "Google enabling their product ads to be linked to an opportunity to buy without leaving its platform is a great step towards a more convenient product search solution." "What remains unclear is how this will impact the narrative retailers have with their shopper - a relationship retailers are hesitant to erode. "We anticipate this will have the largest impact on research intensive or discretionary purchases such as consumer electronics." Google is making further announcements about most of its services and products at its I/O developers conference in San Francisco .